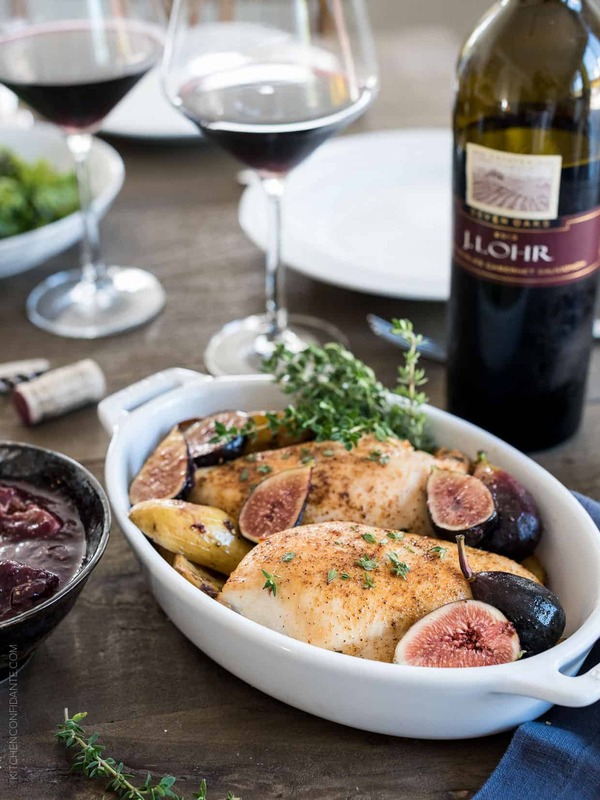 Roast Chicken with Fig Chutney Sauce is all about elevating simple ingredients into something special. Wine helps, too. 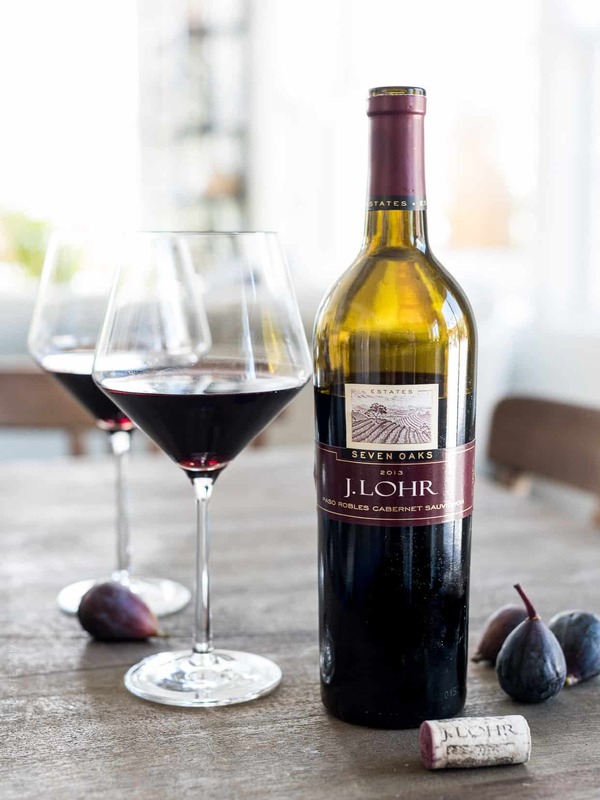 This post is brought to you by J. Lohr Vineyards & Wines. There are certain things you’ll never forget. For example…the first time you met your partner for life…that first phone call…that first date…well, many firsts. I’ll never forget the first meal I cooked for my husband when we were dating, I told you the story around this time last year. Meat and potatoes were a safe bet, I was told, and we still laugh about that meal today. But let’s fast forward a bit, shall we? This year, we just celebrated 15 years of marriage. I honestly don’t know how to comprehend that sometimes. I mean, weren’t we just planning our move cross country just a few weeks ago? We have grown, as couples do, together and individually, but mostly together, which is the most important thing in all of this. When it comes to taste in food, well, lately we’ve been steering ourselves farther away from meat and potatoes, and more towards leaner meals. Lots of salads, lots of seafood, and lots of chicken make it to the dinner table, including special occasions. 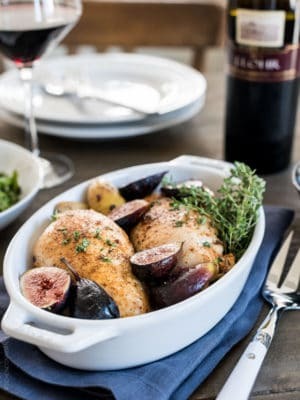 To be perfectly honest, maybe the best thing about Roast Chicken with Fig Chutney Sauce is that it is simple enough for a weeknight meal, too, and if there is anything we have learned in fifteen years of marriage, it’s about making every day special and appreciating each other along the way. And wine. Don’t forget the wine. 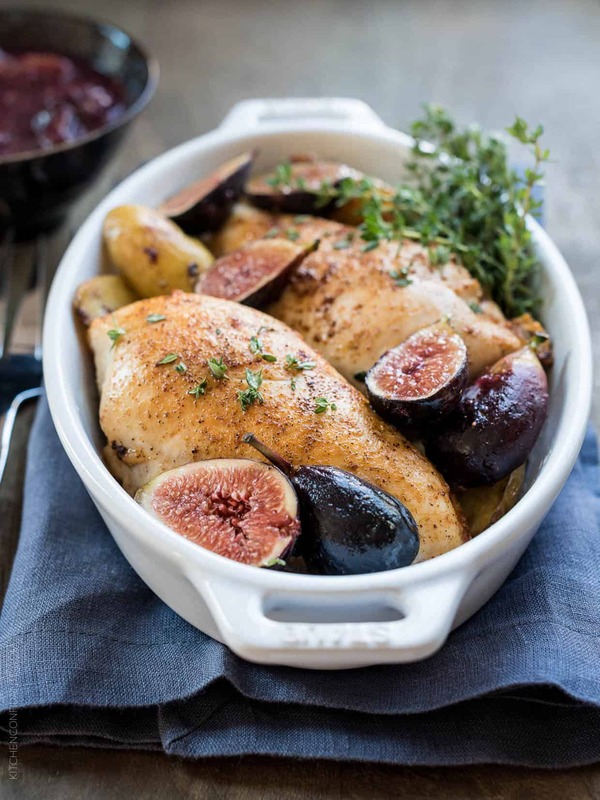 Roast Chicken with Fig Chutney Sauce is all about elevating simple ingredients into something special. Wine helps, too. Place the onions with the wine, red wine vinegar and balsamic vinegar in a small saucepan and bring to a boil over high heat. Lower heat to a simmer, partially cover the pan and cook for about 10-15 minutes, until the onions are tender. Stir in the figs, garlic, honey, soy sauce, ginger and cayenne pepper, and cook for about 5 minutes more, or until the figs have softened but are not completely mushy. Remove from heat. Take approximately half of the mixture and blend it in a blender, and return it to the pan to thicken the sauce. Season to taste with salt. The fig chutney can be made several days in advance if you wish; cool and store in an airtight glass container in the refrigerator until ready for use. Place the chicken breasts in a 9×13 baking pan and brush with melted butter. Season generously with salt and pepper, and fresh thyme (feel free to add your favorite seasonings, if you wish). Toss the potatoes with olive oil, season with salt and pepper, and arrange around the chicken. Roast in the oven for 18-20 minutes or until a thermometer inserted in the thickest part of the chicken registers 165°F. 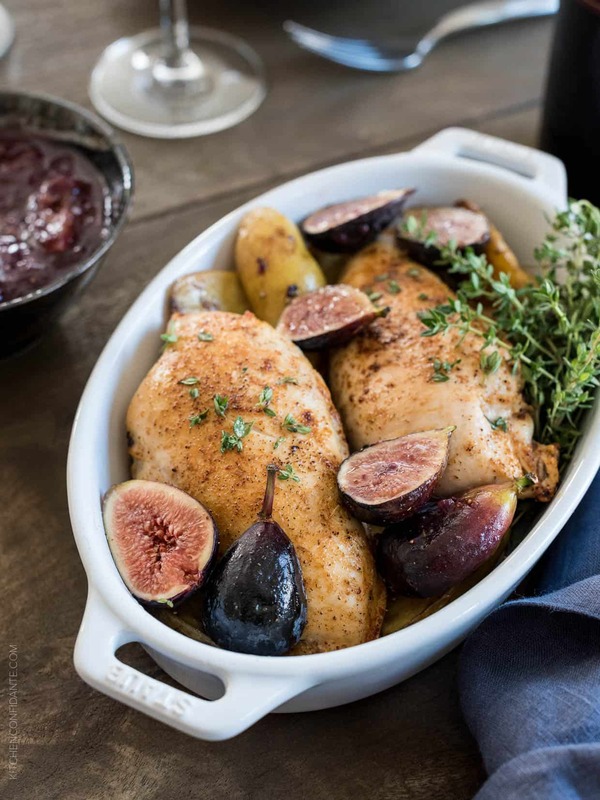 Serve the chicken with the fig chutney sauce and fresh figs, if using. I love roasting chicken on Sundays! Hope your family loves it! This is the most attractive chicken I’ve ever seen. Why not try this weekend, huh? I appreciate you discussing! I will totally apply certain areas, around those I did not know when. There is lots of things like this. 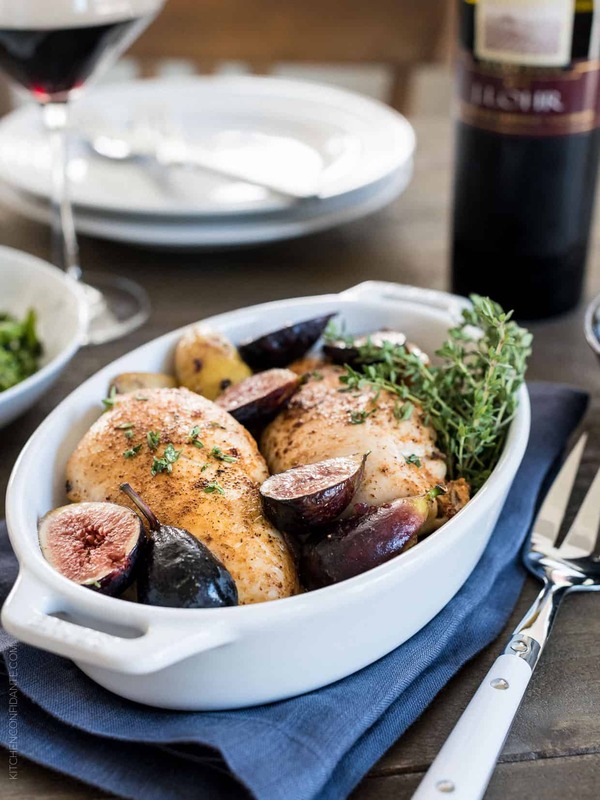 What a beautiful presentation for a dish perfect for entertaining. i love it! such a good suggestion for a sweet weekend evening with my husband. This dish looks so comforting! I love your photos! What a gorgeous meal. It makes me want to cozy on in! Wish you could come over and join us! Incredible. Feel delicious just by first look. Absolutely agree that Roast Chicken with Fig Chutney Sauce is all about elevating simple ingredients into something special. Thanks for sharing, Liren.